A wonderful flowering bonsai kit with small white flowers which contrast beautifully with the blue ceramic pot. This bonsai gioft set includes a pretty porcelain heart tag, drip tray, pruning scissors and bonsai feed. A great gift to get started in the art of bonsai. Free delivery available and the option to personalise with a special message. This lovely bonsai kit makes a wonderful gift for the one you love. 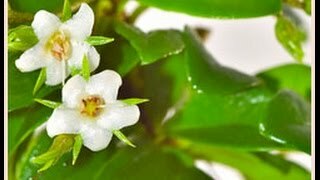 This is a flowering indoor bonsai with dainty white flowers & deep glossy leaves and elegant trunk flow. Included in the kit is the drip tray, bonsai fertiliser, to keep the bonsai strong & healthy, and some pruning scissors. The porcelain heart tag has been also included, this is a beautiful tasteful tag with an obvious message.